In the early 1960s, many of the European air forces were looking for a replacement trainer to keep their aircrew training current with the combat aircraft being operated by each Air Force. At the time, the two principal trainers in use in Western Europe was the French-built Magister and the US-built T-33 Shooting Star. While both still had operational life remaining, it was going to take some time to develop the replacement. Two contenders emerged from the training requirement, the British Aerospace Hawk and the Dornier-Dassault Alpha Jet. The Alpha Jet was first flown in 1973 and would see production for over a decade with around 480 airframes built. The main customers for the Alpha Jet was the German Luftwaffe, French Air Force, Portuguese Air Force, and the Royal Thai Air Force. Other users included Belgium, Egypt, Morocco, Nigeria, Portugal, Qatar, as well as privately owned examples elsewhere in the world. Two major variants were produced by Dornier/Dassault: the Alpha Jet E trainer and the Alpha Jet A close air support aircraft. Egypt modified the Alpha Jet A with further close air support capabilities to create the Alpha Jet MS1 followed by the MS2 with updated engines. Kinetic has been turning out some outstanding subjects that have been largely overlooked by other model manufacturers and here is another. This is the 1/48 scale Alpha Jet which is the first new-tool plastic kit since Heller and ESCI produced their kits years ago. 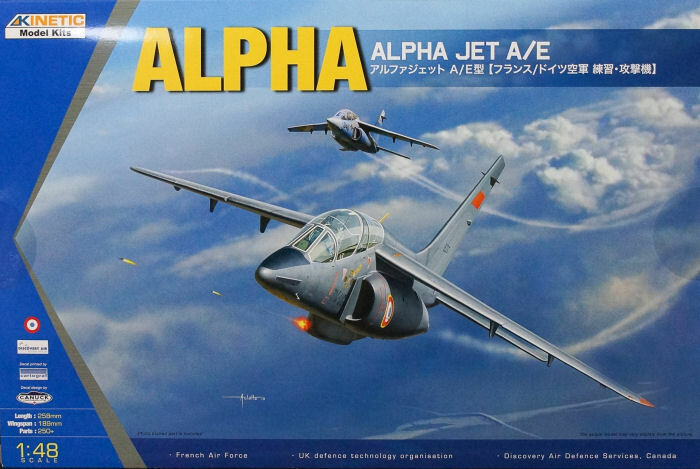 A few years ago, PJ Production made the Alpha Jet in 1/48 scale, but it was primarily a resin kit for the experienced multimedia modeler. This kit is primarily styrene with the only photo-etched parts provided for the seat belts/shoulder harnesses and HUD frame. 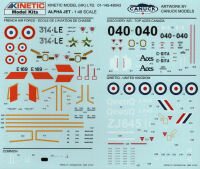 These decals are nicely done and include a nice suite of airframe stenciling. Painting instructions are provided using FS equivalents or Tamiya paints. This is another very nice release from Kinetic and easily tops the old Heller/ESCI options for the best Alpha Jet in any scale (in plastic).